WASHINGTON, April 15, 2019 /PRNewswire/ -- The White House Historical Association (WHHA) has announced its forthcoming book, To Live on Lafayette Square: Society and Politics in the White House Neighborhood, by historian and author, Dr. William Seale. The book will be released on May 15, 2019. This publication details the lives of those who once lived in Lafayette Square, just across from the White House, when the neighborhood was a center of political power in Washington, D.C. Seale's book captures the fascinating history of this iconic neighborhood while also enriching the reader's understanding of the nation's social and political culture. In one notable story, Seale recounts: "Into the Rodgers House in 1859, the corpse of the prominent attorney Philip Barton Key, shot to death outside by his lover's congressman husband, was dragged even as crowds rummaged through the dead man's pockets, taking his handkerchiefs, before the constable arrived. In an upper bedroom of this same house Lincoln's secretary of state, William Seward, was viciously knifed the night Lincoln was assassinated. The house was demolished long after to build an opera house, which contributed its own half-century history to Lafayette Square." William Seale is an American historian and author. His many books include A White House of Stone (2017); Imperial Season (2013); Blair House: The President's Guest House (2016); and the two-volume The President's House (1986 and 2008). He is founding editor of White House History Quarterly, the award-winning journal of the White House Historical Association. First Lady Jacqueline Kennedy envisioned a restored White House that conveyed a sense of history through its decorative and fine arts. In 1961, the White House Historical Association was established to support her vision to preserve and share the Executive Mansion's legacy for generations to come. Supported entirely by private resources, the Association's mission is to assist in the preservation of the state and public rooms, fund acquisitions for the White House permanent collection, and educate the public on the history of the White House. Since its founding, the White House Historical Association has contributed more than $47 million in fulfillment of its mission. 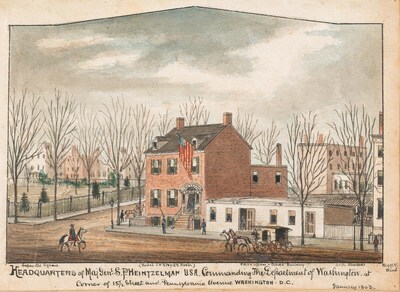 To learn more about the White House Historical Association, please visit www.whitehousehistory.org.